Imagine stepping into a room-sized enclosure, donning a pair of 3D glasses, and having the experience of touring the basilicas in Rome or exploring Philadelphia’s Eastern State Penitentiary or standing in the Sistine Chapel—all without leaving the Library. Well, technically Falvey Hall, which was the Villanova College Library before Falvey Memorial Library was built, will house this new facility, called CAVE. CAVE stands for Cave Automatic Virtual Environment. I know some of you are asking, “Then, what does that “Cave” stand for?” MerriamWebster.com has your answer. The University’s version of this technology is called the Villanova Immersive Studies System (VISS). The VISS allows participants to become virtually immersed in a setting in which they can move about and even circle around the 3D image of an object, such as vase on a pedestal, as though they were in the actual setting. The VISS, in addition to the visual dimension, includes sound. For historical sites that have begun to deteriorate, such as the Eastern State Penitentiary, it preserves them for posterity. For sites of limited space, such as the Santa Rosa Necropolis under Vatican City that cannot accommodate large groups, the VISS allows 10-15 people at a time to examine that location. 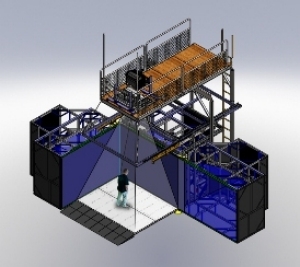 The VISS enclosure—18’ wide, 10’ deep, 7.5’ high—features three walls and a ceiling. An opening, where the fourth wall would be, allows access. Rear-projected HD screens form its walls and ceiling, and it has a front-projected floor. To minimize shadows from viewers, strategically placed projectors create the floor imagery. In addition to the CAVE’s capability to display images, the VISS has a camera component for capturing images and video. The custom-made camera cart actually holds several cameras mounted in a spherical array (software combines the cameras’ input into a single image or video). This camera system includes lights and microphones, all mounted atop a telescopic pedestal that extends to raise the cameras from their five-feet-high retracted position up to a height of twelve feet. Not only can the camera record images and video, it can also stream live images from remote locations. The project is under the direction of Frank Klassner, PhD, professor of computing sciences in the College of Liberal Arts and Sciences, in collaboration with Edmond Dougherty, assistant professor in the College of Engineering, and Darren Poley, interim director of Falvey Memorial Library.